When we think of Rockefeller Center in New York City, we often picture the leggy Rockettes at Radio City Music Hall and the iconic black-and-white photograph, “Lunchtime atop a Skyscraper,” from 1932. However, after teaming up with our friends over at Rockefeller Center, we discovered that there’s more to this plaza than stage shows and construction sites. 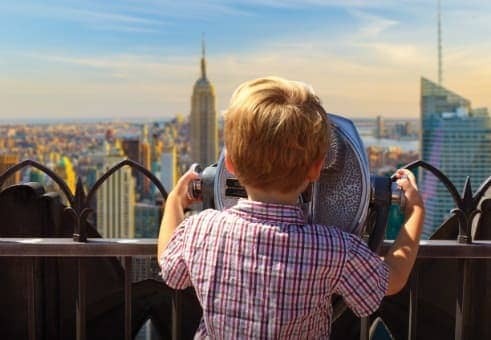 Rockefeller Center is a family destination, and we have highlighted a few child-friendly activities and attractions that will keep your crew entertained during your visit. From ice skating to video games, the kids are in for a real treat on your next NYC family vacation. It’s every kid’s job to beg to ice skate on the Rockefeller rink. There’s something about the frozen expanse that makes children plead for clunky skates and figure 8s. On your next trip to Rockefeller Center, do everyone a favor and surprise your kids with the Sky Skate experience before they even ask. With Sky Skate tickets, your kiddos can carve up the ice and then check out the city from great heights. Venture to the Top of the Rock Observation Deck (on floors 67, 69 and 70 of Rockefeller Center) for extensive views of the Big Apple. From up top, point out Times Square, and Empire State Building to the south, and Central Park and the George Washington Bridge to the north. After dragging your kids to Holly Golightly’s beloved Tiffany’s or the massive flagship Macy’s in Herald Square, they may need some retail therapy of their own. Let them run wild and free at the kid-centric stores in Rockefeller Center. Inspire your kids to build as high as the city’s skyscrapers at The LEGO Store at Rockefeller Center. This interactive store invites your future architects to piece together building blocks in the Living Room play area, and choose their favorite pieces at the Pick a Brick Wall. Discover exclusive LEGO sets and gape at the model displays. For those of you who have kids that can’t get enough of go-kart racing with Mario and friends, Nintendo World will make their gaming hearts flutter. The store boasts two levels of playing stations, including the latest consoles, accessories, and games. Create some family competition on the newest Wii U console, or get in on the fun and challenge their high scores. Viewfinder Tip: Get Sky Skate tickets soon, because they’re only available between January and April. After ice-skating and LEGO-building, fuel up at one of the many kid-friendly food joints around Rockefeller Center. When in doubt, pizza is always a safe option, even for the pickiest of eaters. Gobble up some slices at Harry’s Italian Pizza Parlor on the Rockefeller Center Concourse Level. This pizza joint serves up basic selections such as pepperoni and cheese, along with more daring options such as bacon chicken ranch and buffalo pies. Alternatively, if you’re looking for more of a restaurant setting, dine with your gang at Rock Center Café. This American grill offers something for everyone as it features both a regular menu and a children’s selection. With a view of the ice rink, indulge in chicken scaloppini or a pork loin panini while your kids scarf down chicken tenders or grilled cheese. If your munchkins have behaved all day, round out your Rockefeller Center adventures with a sweet stop at Teuscher Chocolates, located in the Channel Gardens of Rockefeller Center Plaza, near Fifth Avenue. The confection selection at this chocolate shop ranges from butter crunch truffles to mouthwatering marzipan. Your little ones especially will adore the fantasy figures filled with chocolate, such as the quirky frog princes and feathery yellow chicks. Whether your kids are circling around the ice rink or chowing down on chocolate, Rockefeller Center is a NYC hot spot on which everyone can agree. What are your favorite kid-friendly spots in New York City?